F airy tales play a crucial role in childhood. They represent imagination and creativity while allowing children to have a safe way to experience and process mature content, such as poverty, violence, and death. Often, fairy tales act as the first form of exposure children have to other cultures, to morals and values and to the concept of death itself. This sentiment is reflected through Canadian Wonder Tales, published in 1918 by Cyrus Macmillan, which is a collection of Canadian fairy tales and stories located in the Children’s Literature Archive at Ryerson University in Toronto, Ontario. First published in 1918 by the John Lane Company, Canadian Wonder Tales was largely written and edited while Macmillan was fighting in France during WWI. Macmillan, as a member of the 7th Siege Battery in France, played a crucial role in the Canadian victory at Vimy Ridge. Most of his correspondence and editing occurred in between regular military duties while serving in France (Macmillan xii). The collection features illustrations by British artist George Sheringham, who was widely recognized as an influential artist of hist time (“George Sheringham R.D.I. 1937”). The collection was edited and sponsored by Scottish scholar Sir William Peterson, who also contributed the Forward to the book. The concept of the effect of fairy tales during times of war becomes a critical aspect of childhood development: fairy tales act as an imaginative escape from the cruel reality of wartime and define foreign cultures in the minds’ of young and impressionable children. During times of heightened hostility amongst different nations and cultures – such as war, fairy tales act as the sole understanding children have of the world around them. These stories mold the perspective children have for their entire lives. Canadian Wonder Tales is a collection of fairy tales from a Canadian perspective. Macmillan, before he fought in WWI, travelled across Canada hearing stories and tales from fellow travelers, natives, fisherman, sailors, and townsfolk (xii). In similar fashion to how the Grimm brothers collected and wrote their collection of fairy tales a century earlier, Macmillan set out to experience a wide variety of tales that represented Canadian culture (vii). The stories in this collection revolve around the natural wonders of Canada: the fantastic environments of mountains and lakes, the extensive animal life, and the people that inhabit this country. Many of the people that told stories to Macmillan brought their tales to Canada after immigrating to the country from foreign lands, specifically Europe. Through this influence, as well as Macmillan’s romanticised European writing style, many of the tales incorporate a European experience or understanding (vii). Combining this European influence with the Aboriginal stories and Canadian landscape, the result is a collection of tales that is uniquely Canadian. These tales focus on the natural wonders of life in Canada and express the multicultural aspects of the country. This collection features 32 various stories including “Glooskap’s Country,” ”The First Mosquito” and “How Summer Came To Canada.” Each story is accompanied by a beautifully drawn illustration from Sheringham in a native style. Sheringham also contributed the native-influenced front and end cover illustrations for a total of 32 pictures. However, this collection of fairy tales is featured directly alongside The Rough Road, which is a fictitious war novel by William J. Locke. The significance of this is that the publishing company recognized a wartime novel and a collection of fairy tales as equals: they share a similar placing in the advertisement, suggesting they were of relatively equal importance to the company. While it was marketed as a children’s book, the reception of Canadian Wonder Tales demonstrates the crossover between childhood literature and adult literature. This is one significant example highlighting the reduced presence of innocence in childhood as a result of the violence of war. Macmillan’s work was highly recognized in Canadian literature, especially in terms of his native stories and content. 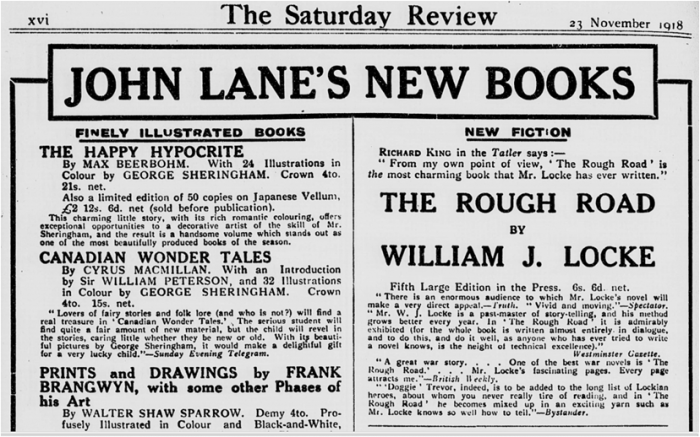 In a December 1955 review from the Globe and Mail, the author acknowledges another collection written by Macmillan called Glooskap’s Country and Other Indian Tales. This was published more than 30 years after Canadian Wonder Tales, yet features many of the native stories from Macmillan’s original collection. The author of the review recognizes Macmillan as a master craftsman of storytelling (Pratt 16). This demonstrates how Macmillan’s work continued to be relevant in a Canadian and native context for years after Canadian Wonder Tales was published, highlighting both the significance of the work and the importance of the author. Another article from the Globe and Mail in November of 1956 recognizes Macmillan as the winner of the Bronze Book-of-the-Year medal from the Canadian Association of Children’s Librarians for his collection Glookskap’s Country and Other Indian Tales. This further demonstrates how Macmillan’s work in Canadian Wonder Tales continued to be relevant and significant to Canadian literature – especially children’s literature – even after his death in 1953 (“The Fly Leaf” 13). According to Priscilla Ord and Carole H. Carpenter, Canadian literature is overshadowed by American and British literature. Very little Canadian literature is produced in comparison to these sister countries. However, they argue that the content of these books is uniquely Canadian, separating itself from the likes of American imperialism and British themes, and revealing critical cultural elements of Canada (Ord and Carpenter 3). This idea is reflected in Canadian Wonder Tales, which portrays an exclusively Canadian perspective and has been recognized for such an achievement. Both Macmillan and Peterson were respected leaders in the field of education and literature. Macmillan, before going to France, was the Head of the English Department at McGill University in Montreal, Quebec, while Peterson was the Principal of the University through wartime. Each man played a significant role in the Canadian war effort. Peterson led McGill’s contribution to the war, lending his campus and facilities to the training of Canadian troops. He was an avid supporter of volunteer soldiers, sending volunteer students and faculty to Europe in McGill regiments that came to be known as the No. 7 Siege Battery. Macmillan volunteered to fight in France as a member of the 7th Battery, which played a crucial role in the Canadian victory at Vimy Ridge: both a defining moment in WWI and in Canadian history (Macmillan 261). Each man was heavily involved in the Canadian war effort, and each acted as though this collection of tales was of utmost importance to produce during this time. Macmillan spent his shifts off writing and editing the collection, while Peterson spent his spare time editing Macmillan’s work (Macmillan vii). It must be acknowledged that these trusted and respected literary scholars believed in the importance of Canadian Wonder Tales so much that they wrote, edited, and published the book while contributing to the Canadian war effort. According to literary scholars and analysts Marilyn Fleer and Marie Hammer, fairy tales play a key role in the cognitive development of children. They act as cultural devices that allow children to develop tools for emotional regulation (Fleer and Hammer 240). In their analysis, Fleer and Hammer suggest that children incorporate the ideas and concepts of fairy tales and other children’s stories to understand situations in their everyday lives. These situations are emotionally charged, allowing children to experience them and gain an understanding of the imaginative space without feeling threatened (256). Furthermore, Fleer and Hammer argue that illustrations make the text more engaging for children (250). The detailed illustrations from Sheringham in both black and white and colour contribute to visual stimulation and imagination for children, making the collection more interesting and appealing for younger audiences. These theories of cognitive development directly apply to Canadian Wonder Tales. Both Macmillan and Peterson, as literary scholars, recognized the pedagogical merit of fairy tales and stories – especially during times of violence – and made it their goal for Canadian children to be able to experience these situations and process their emotions in a safe environment. During WWI, fairy tales were a safe and simple way for children to understand the perils of violence and death while seeing these evils presented with positive resolution: the hero is almost exclusively victorious in these stories. For example, in “Star-Boy and the Sun Dance,” the young man known as “Star-Boy” is born poor and with an ugly scar on his face which prevents him from marrying the girl he loves. After a long and treacherous journey, the boy meets the Sun and Moon, who promise to remove his scar and guarantee the love of this girl if he has an annual festival in their honour. They boy accepts this deal and they deliver on their promise. The boy marries the girl and lives the rest of his life in happiness (Macmillan 12). This story demonstrates that a child, born into poverty and a victim of violence, can rise from this situation to become happy. This tale is a perfect comparison to children who grew up as victims of poverty and the violence of war, offering hope and happiness and allowing them to cope with the perils of their reality. Children are able to relate to the characters in these stories and better understand their role in the world through the experiences of these fictional characters (Fleer and Hammer 241). During a time in Canadian culture when the innocence of childhood was sparse, Canadian Wonder Tales was able to reintegrate imagination and creativity into the lives of children, helping them to cope with the mature content of violence and death that surrounded their everyday lives. By reading and understanding the situations in fairy tales, children are able to understand their own circumstances (Feuerverger 234). This learning tool helped mold an entire generation of Canadian children. This important role of fairy tales in childhood development is recognized through adulthood. According to researcher Donald Haase, fairy tales act as a point of reference for adults. These stories allow adults to reflect upon how they responded to cultural and societal revelations as children. Specifically, adults acknowledge how they were exposed to specific ideas – such as death, violence, and poverty – through stories (Haase 361). The significance of this is that is demonstrates the impact fairy tales have on children throughout their entire lives. Furthermore, these stories act as the foundation of cognitive development in adults; this understanding is recognized through adulthood (362). This idea supports the strong reception of stories in Canadian Wonder Tales through the 1950’s. Adults in the 1950’s reflect upon literature from their childhood, such as Canadian Wonder Tales, and recognize its significance in their cognitive development. These adults continue to acknowledge the text for its impact on Canadian literary society and its influence on their own lives as children. The strong praise the text and author received decades after its publishing support the concept that fairy tales play a pivotal role in childhood development and the education of society as a whole. Through analysing the effects of fairy tales on childhood development, it is evident that the imaginative space of the stories in Canadian Wonder Tales contributed to children’s understanding of the violent world around them during the years of WWI. By allowing children to both understand violence and explore the imaginative space of fairy tales in a safe way, this collection of stories acted as an escape for children who were thrust into maturity because of the violent era they experienced. After acknowledging the scholarly virtues of Macmillan and Peterson, as well as their extensive contributions to the war effort overseas, it should be recognized that the production of Canadian Wonder Tales was their contribution to the Canadian war effort at home. Cooper, John A. Men of Canada. Montreal : Canadian Historical Co., 1901. Internet Archive. Web. 24 Feb. 2014. Feuerverger, Grace. “Fairy Tales and Other Stories as Spiritual Guides for Children of War: An Auto-Ethnographic Perspective.” International Journal of Children’s Spirituality 15.3 (2010): 233–245. EBSCOhost. Web. 24 Feb. 2014. Fleer, Marilyn. “Emotions in Imaginative Situations: The Valued Place of Fairytales for Supporting Emotion Regulation.” 20.3 (2013): 240–259. Web. 23 Feb. 2014. “George Sheringham, R.D.I.” Journal of the Royal Society of Arts 86.4435 (1937): ProQuest. Web. 24 Feb. 2014. Haase, Donald. “Children, War, and the Imaginative Space of Fairy Tales.” The John Hopkins University Press: The Lion and the Unicorn 24.3 (2000): 360–377. ProQuest. Web. 24 Feb 2014. “John Lane’s New Books.” The Saturday Review 23 Nov. 1918 : 16–16. ProQuest. Web. 27 Feb. 2014. Macmillan, Cyrus. Canadian Wonder Tales. Illustrated by George Sheringham. Second Edition. New York: John Lane Company, 1918. Print. Macmillan, Cyrus. McGill and Its Story, 1821-1921. New York: John Lane Company, 1921. ProQuest. Web. 26 Feb. 2014. Ord, Priscilla, and Carpenter, Carole Henderson. “Canadian Children’s Literature: A Cultural Mirror.” Children’s Literature Association Quarterly 2.3 (1977): 3–6. Project MUSE. Web. 24 Feb. 2014. Pratt, Viola. “Classic Canadian Legends.” The Globe and Mail (1936-Current) 10 Dec. 1955. ProQuest. Web. 23 Feb. 2014. “The Fly Leaf.” The Globe and Mail (1936-Current) 17 Nov. 1956. ProQuest. Web. 27 Feb. 2014. “The Honourable Cyrus Macmillan, P.C.” Parliament of Canada. Web. 24 Feb. 2014.